A few hours ago, Manchester United FC emerged as the 2007/2008 Champions of the English Premier League (Officially known as "Barclays Permier League") after beating Wigan Athletic FC 2-0. This season, Man Utd started well & maintained a good momentum throughout the season. But prior to the last game of the season, they were sharing points with Chelsea FC at the top of the league standings. Fortunately, they led by goal difference. So if both teams won tonight, Man Utd would still be crowned champions. But the reality is, Chelsea drew while MU won. So for my readers who are in Malaysia, when you go out tomorrow, don't be surprised when you see everybody wearing red jerseys & feeling all so proud of it. Because 80% of Malayisan football supporters support MU!!! A piece of good advice I have for the Chelsea supporters is keep your love for your team in your heart. Aviod putting on your jersey... at least until next Wednesday when you go to your favourite mamak to see Chelsea play Man Utd in the UEFA Champions League Final. Another piece of advice that is just as good is... pray that your team wins that one or you may have to keep your jersey in the closet for good! It could have been the same story in the Italian Serie A (Officially known as "Lega Calcio Serie A TIM") for Inter Milan tonight, if they had won in their fixture against AC Siena. But they drew 2-2. The 2007/2008 league form of Inter was pretty much like that of MU. They started the season well & maintained a good momentum throughout the season. However, they started having hiccups at the end of the season. Last week, they had a 6 point lead in the league at first place. Therefore, in last week's fixture itself, they could have won the title. But they lost 2-1 to AC Milan. And then, this week, they drew. This gave AS Roma, in 2nd place, a chance of closing the gap between them. Which they did... gladly. Now, the 6 point lead has been decreased to a 1 point lead. Next week, both teams play the decisive last fixture of the season. Inter is away against FC Parma. Roma is away against Catania Calcio. The two top teams fighting for top spot will be up agasint two borderline teams fighting to avoid relegation. 4 desperate teams... Who will prevail? If Inter lost again & Roma draws, Inter is champion (Inter have a greater goal difference). 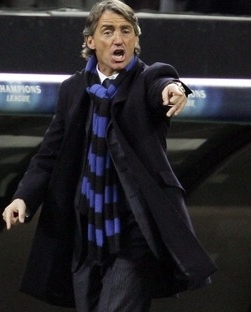 Both Inter & Roma will have to aim for a win against teams that have nothing to lose! Stay tuned to see how the drama unfolds! The team that I support, AC Milan, has not been doing well in the Serie A. Bad form & inconsistancy in the league have seen this 2007 FIFA Club World Cup & 2006/2007 UEFA Champions League winner getting pushed around by smaller Italian clubs. They seem to be the Liverpool FC of Italy. Doing badly in the domestic league but doing surprisingly well outside of it. This season, they won the Club World Cup. But they were beaten in the quarter finals of the Champions League & is now struggling to be in 4th place of the Serie A. The 4th place in the league is significant because clubs in the 1st to 4th place are given a place each to compete in next season's UEFA Champions League. Milan, currently in 5th place, is struggling against ACF Fiorentina, currently in 4th place. They are seperated by 2 points with Milan having the greater goal difference. Next week is the final chance for Milan to retain a place in the Champions League, but the odds are against them. Milan have a tougher fixture with, 7th place, Udinese Calcio. Fiorentina have an easier game with, 15th place, Torino FC. For Milan to even have a chance, Fiorentina's game has to result in a draw or a loss. If Milan wins & Fiorentina draws, Milan wins 4th place. If Milan wins & Fiorentina loses, Milan wins 4th place. If Fiorentina wins, Fiorentina stays in 4th place. If Milan draws or loses, Fiorentina stays in 4th place. I'm hoping that Milan wins & Fiorentina draws or loses. But whatever the result, I'll still support Milan because I love the team more than I love glory & boasting. I love Milan's history as well as the positive & determined attitude of both it's coaches & players. The team is also an actual team. There are no one man stars in this one. Every game is a team effort. The benefits of a win are shared & the burdens of a loss are shared as well. Every player has his specialty & when there is a good combination, the team is a force to be recond with. I am still with you, Milan. I will be loyal till I die!